On Monday in Dubai, U.S. Secretary of Commerce Penny Pritzker toured the Mohammed bin Rashid Solar Park by helicopter, getting a firsthand look at how cooperation between the U.S. and Dubai can lead to tremendous opportunities for businesses in both countries. The solar park was built by First Solar, a company based in Tempe, Arizona that is currently accompanying Secretary Pritzker as part of her trade mission to the Middle East. Completed in October of 2013, the solar park is a 13 megawatt power plant and the largest solar facility of its kind in the Middle East.This solar park proves U.S. businesses can serve as strong business partners to the Gulf region as UAE invests in its infrastructure and transportation systems. After the tour, Secretary Pritzker and the business delegation met with Dubai Electricity and Water Authority (DEWA) project specialists and DEWA CEO Al Tayer to further discuss DEWA’s investments in water, electricity and renewable energy projects, all of which offer additional opportunities for American companies to serve as partners. 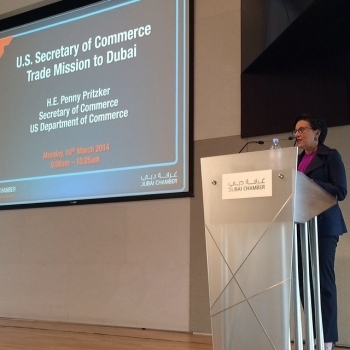 In addition to her tour of the solar park, Secretary Pritzker held several meetings on Monday to support U.S. companies as they explore business opportunities in Dubai’s infrastructure expansion. She met with Dubai Chamber of Commerce and Industry (DCCI) officials and World Expo 2020 committee members to congratulate Dubai on winning the World Expo 2020 bid and to offer the Commerce Department’s support in preparation for the Expo. Held every five years, the World Expo attracts millions of visitors to the six-month long exhibition of trade, innovation and products from around the world. Dubai Expo 2020 will focus on sustainability, mobility, and opportunity, and will be a platform for connectivity to help pioneer new partnerships for growth and sustainability for the future. Secretary Pritzker also had a bilateral discussion with His Highness Mohammed bin Rashid Al Maktoum, Ruler of Dubai and Vice President of the United Arab Emirates. She emphasized the strength of the U.S.-Dubai commercial relationship, underscoring that the UAE is the United States’ largest export market in the Middle East and North Africa. As of 2012, the total stock of direct investment from UAE to the United States stood at $21 billion, making it the 19th largest source of FDI in the United States. She also thanked His Highness for Emirates Airlines’ continued partnership with Boeing International, headquartered in Chicago, Illinois. In November, Emirates Airlines placed an order of 150 777X valued at $55.6 billion by Emirates and 86 737s valued at $8.8 billion by FlyDubai, making it the largest ever aircraft order in civil aviation. 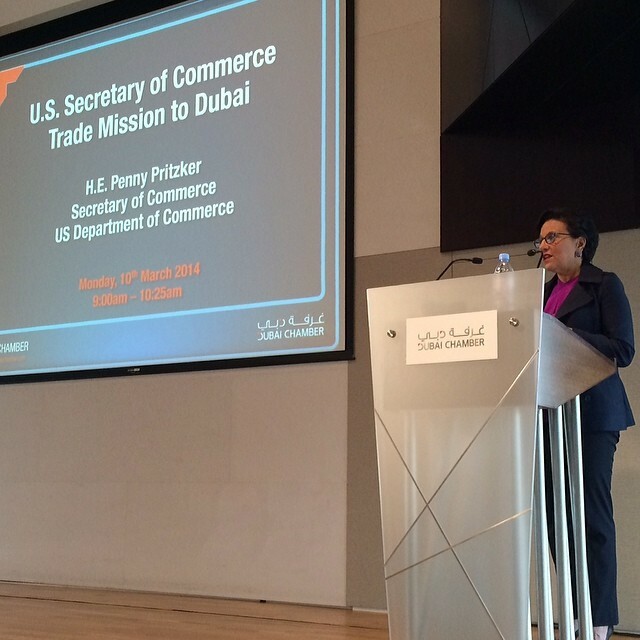 Secretary Pritzker ended her visit to Dubai with a luncheon co-hosted by the American Business Council of Dubai, the U.S.-UAE Business Council, the U.S. Chamber of Commerce, and the Dubai Chamber of Commerce & Industry. Monday marked the end of the first leg of the Middle East trade mission, and Secretary Pritzker and the business delegation are now in Saudi Arabia. On Wednesday, Secretary Pritzker and the U.S. business delegation travel to Qatar, the final stop of the Middle East trade mission.